As we go through life we share pieces of ourselves with those around us, building relationships and leaving impressions on those we encounter. Our smells and the fragrances we wear, just like our actions, act as time capsules that tie people’s memories to us like silver threads. It is this idea that inspired Francis Kurkdjian to create APOM Pour Femme and Pour Homme. Both masculine and feminine APOMs centre around orange blossom, a flower that evokes sensuality and closeness, and cedar wood, a material that speaks of arid landscapes. 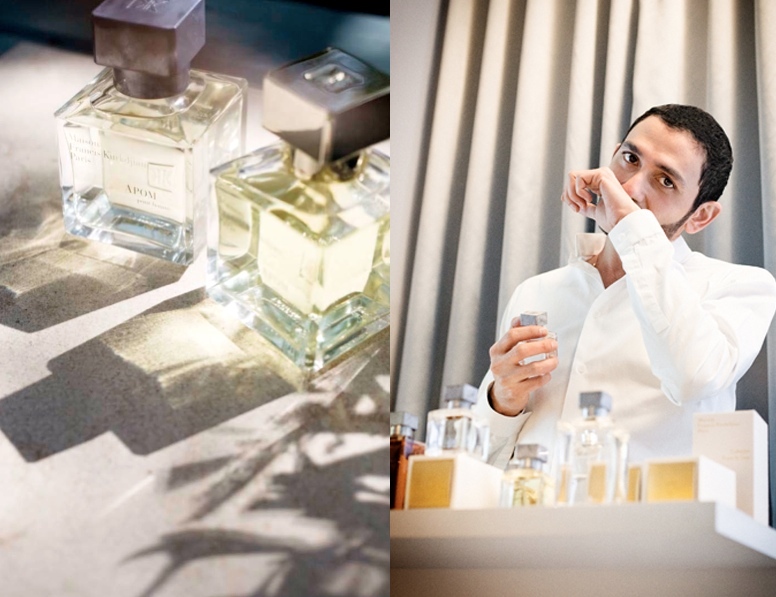 In typical Kurkdjian style both fragrances are exceptional examples of their style and the duo itself offers a stark contrast of both softness (Femme) and strength (Homme). Having spent a good deal of time with most of the Maison Francis Kurkdjian line I feel as if I am well-versed enough to be able to pick favourites. I think OUD, Aqua Universalis and Absolue Pour le Soir (review coming soon) are standouts, perhaps because they are so bold and unique, but it is in the subtlety of APOM Pour Femme and Pour Homme that I have found real enjoyment. Right from the word go APOM Pour Femme exudes a bright Mediterranean warmth that is bright, sunny and exotic. Soft, yet juicy citrus fruit in the top notes blend perfectly into a heart of beautiful tropical flowers with a warm, hay-like quality. In her review for Now Smell This Jessica said that APOM Pour Femme’s orange blossom had an “edible, almost pastry-like effect, as though a shell of almonds and honey were encasing the floral notes” as welling drawing a comparison to Guerlain’s L’Heure Bleue. I can definitely go along with both of those observations; there is most definitely something doughy about APOM Pour Femme that is similar to L’Heure Bleue and more recently Oscar de la Renta’s Esprit d’Oscar, and when smelling it I can’t help but think of sugary sweet Jordan Almonds. The cedar wood, which can be harsh, dry and spicy at times is silky smooth and ever-so-slightly powdery in APOM Femme. There is a hint of something bitter and biting lurking behind the powder that stands to remind you that with all white florals there is a hint of danger, but on the whole this orange blossom wants to give you tender kisses rather than eat you alive. If, like me, you love orange blossom then you owe it to yourself to seek APOM Femme (and Homme for that matter, but we’ll get to that in a moment). I find it to be a fantastic orange blossom that is very subtle in its approach. You won’t be bowled over by it on the first spritz but spend some time with it to figure out all of its intricacies and I promise you that you wont be disappointed. 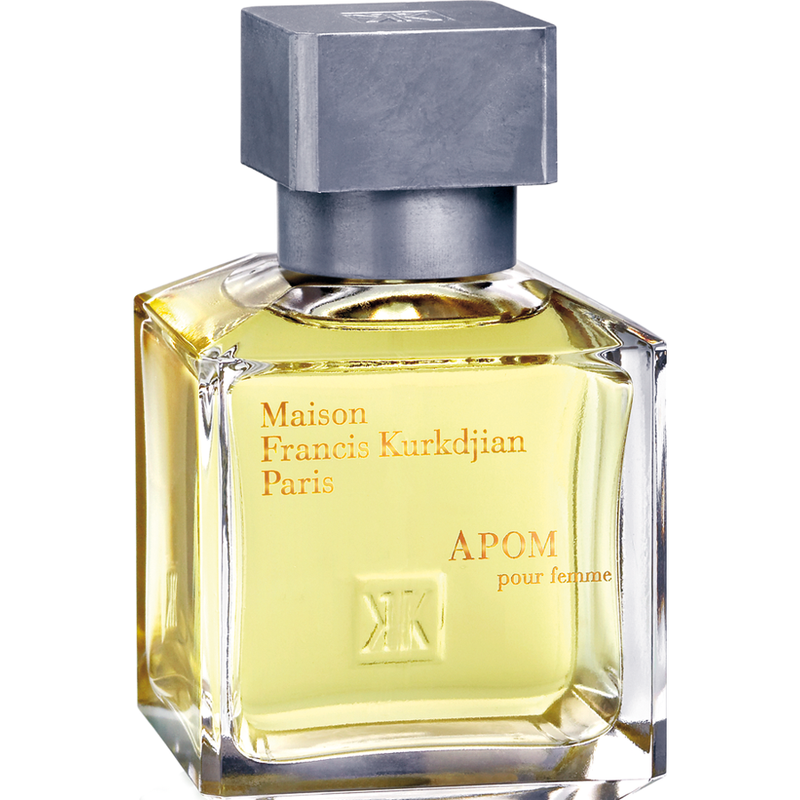 It is a testament to Kurkdjian’s talent that whilst following a very similar theme both APOM Homme and APOM Femme are vastly different fragrances. Where APOM Femme is soft and cool, even slightly aloof, APOM Homme is warm, welcoming and really rather butch (for want of a better word). Where APOM Pour Femme’s orange blossom is accented by Mediterranean fruits APOM Pour Homme’s is bolstered by warm spices and amber giving it a slightly middle-eastern feel. The initial effect is somewhat sour and unsettling creating something akin to the air of a big 80s masculine fragrance with its citrus, spices and woods but it never quite becomes so manly that it is a parody. It peaks at just the right level. Cinnamon-tinged amber compliments the astringent orange blossom for the majority of APOM Pour Homme’s life span. There is enough cosy stuff (benzoin and vanilla etc) to ensure that this astringent quality doesn’t overpower and allows for the dry, fuzziness of the cedar to flash through intermittently in the far dry down. Balance has always been Kurkdjian’s forte. I’d be hard pressed to choose which APOM I preferred, they are very different fragrances after all, but there is most definitely space for both in a fragrance wardrobe. I definitely find myself reaching for APOM Pour Homme more (shock horror I know) but I know for a fact that I wouldn’t want to be without APOM Pour Femme either. Which one I would wear on any given day entirely depends on which part of me I want to reveal to the world; if I want to show the world that I am shy and aloof I will reach for APOM Pour Femme and if I wanted to highlight my macho, yet sensitive side I’d pick up my bottle of APOM Pour Homme. Who knew orange blossom could be so versatile? APOM Pour Femme and Pour Homme are available in 70ml Eau de Parfum and Eau de Toilette respectively with prices ranging from £105-£115. APOM Pour Femme is also available in an Extrait de Parfum set containing 4 x 5ml ‘Elixir’ roll-ons for £95. In the UK they can be purchased from Les Senteurs, Liberty and Selfridges. PR samples. Image 1 via franciskurkdjian.com (2 images combined). Image 2 via sahling-duefte.com. Image 3 via thescentedhound.wordpress.com Notes and quotes via franciskurkdjian.com. 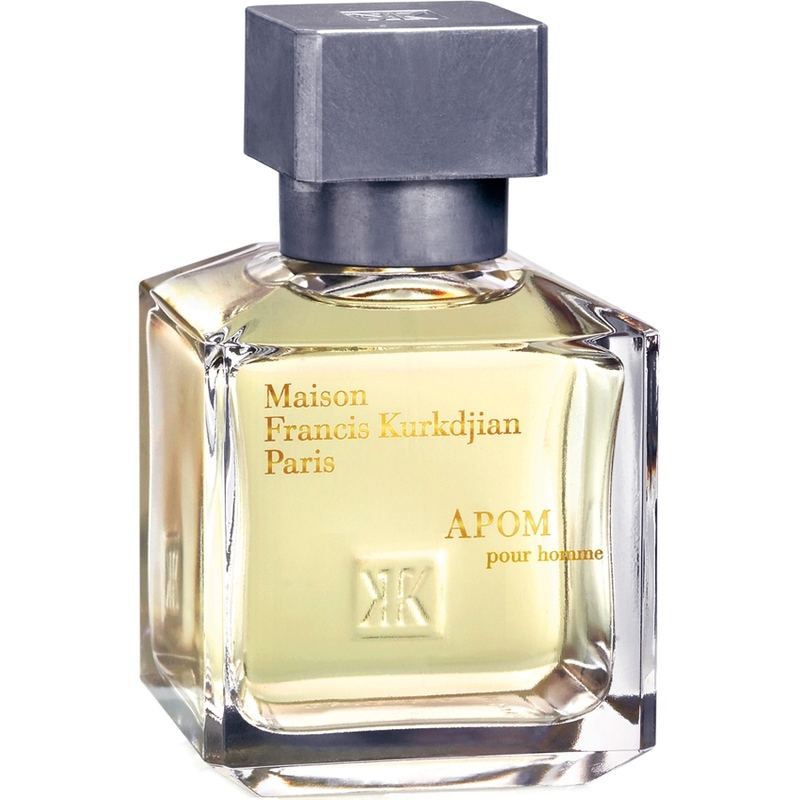 Posted in Feminine, Floral, Maison Francis Kurkdjian, Masculine, Oriental and tagged APOM, APOM Pour Femme, APOM Pour Homme, Fragrance, Francis Kurkdjian, Maison Francis Kurkdjian, Orange Blossom. Bookmark the permalink. I still need to try APOM but you certainly made me want to try it even more. You’ll like these two I’m sure. I shall review those soon. They’re interesting. They’re quite popular. I know that the masculine one gets a lot of good praise. I will say that I’m not as keen on the Lumiere duo as I am APOM. Ooh, I love APOM pour femme and you have captured its scent perfectly. I also love Esprit d’Oscar, interestingly… APOM sums up how perfume is now such A Piece Of Me – or my life, certainly! I can see APOM Pour Femme as being very you! Lovely reviews of both. It’s great when we can find different aspects of ourselves reflected in a fragrance. That one of my most favourites things about this perfumania. I was one of those underwhelmed by APOM pour Femme on first sprintz so obviously I need to give it more time. I am definitely an orange blossom fan. I can imagine that candle might be going on your Christmas list! Did you give Pour Homme a go? You might prefer it to the Pour Femme I think. In Paris I went to the Maison. I was shocked by APOM – in my 20+ years journey that was the best scent, hands down. I bought it immediately, and no regret. A hell of a perfume. Is this APOM Femme? It’s wonderful, truly! Thanks for your reviews of APOM. The feminine has been my favorite fragrance for a solid year. Thanks to you, I’m anxious to try the masculine, also! Here’s a perhaps silly question: whatever is the proper pronunciation of the name? Is it “AY-pom”? “Uh-POM”? Or do you say the letters individually, “A-P-O-M? Help, anyone, please? Thank you!! I tend to go for AY-pom, simply because it sounds best. I could be wrong though.